Author: Gertrud Schneider-Blum. Series edited by: Hans-Jürgen Sasse †. 16 pp. Roman, 497 pp. Alaaba belongs to the Highland East Cushitic languages of the Cushitic language family, which itself is one of the branches of the Afroasiatic language phylum. The Alaaba people number about 204,000, and live in the Southern Nations’, Nationalities’ and Peoples’ Regional State of Ethiopia. Their area is surrounded by the Oromo Region, the Hadiyya Zone, the Kambaata/Tambaro Zone, the Silti Zone and the Sidama Zone. According to their oral traditions, the Alaaba have their origin in Arabia. After long period of migration, they finally settled in Ethiopia. They gradually exchanged their life as cattle-keeping nomads for that of settled farmers. According to the 1994 census, most of the Alaaba people (91.1%) live in rural areas and are engaged in agriculture. The main crops are maize, t’eff, wheat and hot pepper. However, cattle-breeding is still more important to them than tillage, so that the farmers also keep cattle, goats and sheep, chickens and a donkey or mule, if possible. While there are some general publications on Highland East Cushitic languages, studies which mention Alaaba or focus on it are very rare. The present work is a descriptive grammar with the aim of giving an overview of the structure of the Alaaba language. Further, with the citation of many of the non-elicited sentences, in particular the proverbs, an attempt has been made to give an initial insight into the culture of the people whose language is at the centre of attention here. The main chapters of this grammar deal with the Alaaba phonology, morphology and syntax, and contain many graphs which mainly illustrate phonological phenomena. Some texts with traditional contents, as well as English-Alaaba and Alaaba-English word lists complete this work. 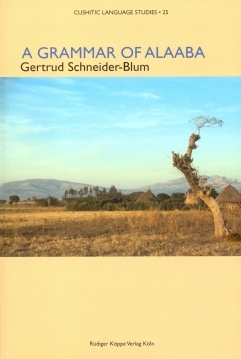 In 500 pages Gertrud Schneider-Blum condenses a remarkable wealth of descriptive details on this Cushitic language of Ethiopia. It is one of the three outstanding descriptions of Highland East Cushitic languages recently produced in Germany. The other two explore Kambaata (Yvonne Treis 2008) and K'abeena, (Joachim Crass 2005), respectively. [...] Judging from some of her comments on fieldwork conditions [...] one gets the impression that she enjoyed her time with the people of Alaaba Kuliito. The good relations with the Alaaba people is also reflected in the quality of her data. [...] The analysis is so detailed and clear that it is hard to find any point of real criticism. [...] This Grammar of Alaaba is a reference work for those who want to learn about Alaaba and Cushitic language typology. It is the result of the hard work of a talented colleague who has filled another gap in our knowledge of the languages of the Horn of Africa.